Sometimes one nail color just isn't enough, you know? 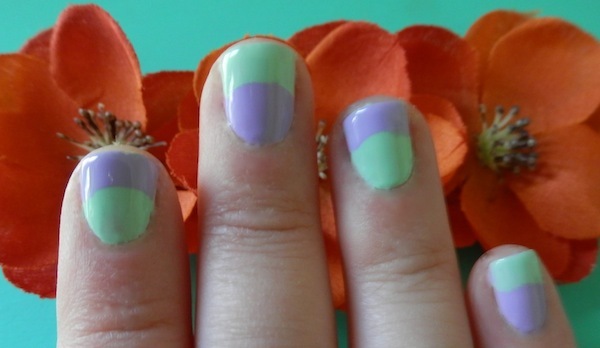 I love finding ways to create simple nail art that looks interesting without taking too much time and energy. I can't be devoting precious TV watching minutes to hunching over my nails with a polish-dipped toothpick and a furrowed brow. I have priorities. Let's be honest - detailed nail art is the most fun after you're done, when people are looking at your perfectly drawn ice cream cones or whatever and giving you compliments. When you're actually doing it, it can be frustrating. I used to be obsessed with painting pictures and scenes on my nails in my younger years, and it wasn't unusual to see a cloudy sky (with shading!) or a full on plaid look on my fingers. I still like to do detailed looks from time to time, but when time is a factor simplicity is key. That's where looks like this one come in. Paper reinforcement stickers are great for manicure tricks (as are actual nail stickers like these) because they give you a crisp line upon which to make your nail magic. That is basically what nail art is. You are a nail magician. Let's cast a spell together, shall we? Paint your clear base coat and let it dry completely. I only use fast dry ones because I am impatient. 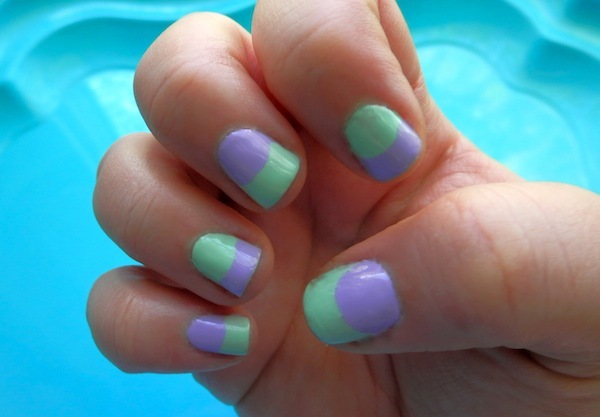 Paint half of your nails with the mint green polish and the other half with the lilac polish in an alternating pattern. I made each hand different (3 green nails on the left hand and 2 on the right hand). Peel off a sticker and stick it to the back of your hand. This removes some of the tackiness so you get the perfect amount of sticky on your nails. They're a little too much right from the package. Place the de-sticky'ed (yes, we'll go with that) sticker about halfway down your fingernail, as pictured, and press down around the edges to secure. Paint the tips of your nails with the opposite polish color as you used for the base. 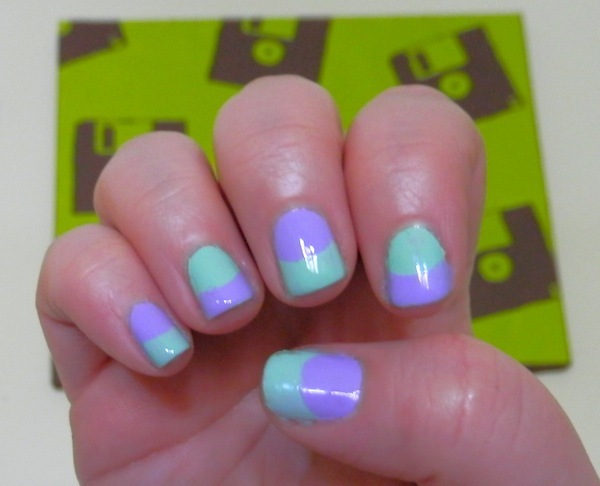 So, paint lilac tips on the mint green nails and mint green tips on the lilac nails. This was probably not a necessary explanation. Let's move on. Peel the stickers off slowly and carefully to reveal a (hopefully!) clean line. If you get any weirdo bits or messy edges just clean them up with a q-tip and maybe a little more polish if you need it. Cover in a layer of Seche Vite top coat. I mean, you can use other top coats, but why bother? If you're in the nail game you probably don't need to hear this, but if not please listen up: THERE IS NO OTHER TOP COAT! You might think that you've seen them in stores or even purchased them, but once you try Seche Vite you will realize that those other impostors were just there to waste your money and break your heart. This is the real deal. It dries SO FAST I don't even understand the physics of it, and when I say dry, I mean DRY - as in I could, like, do the dishes 5 minutes after I put this stuff on. Not that I would, but I could. It sets in minutes as if your manicure has been there for days. What would happen if you tried to use your top coat and then wash dishes minutes later? It would probably be a goopy, sad mess, yes? I told you those other top coats will just break your heart. I'm looking out for you! USE THIS STUFF. Done! 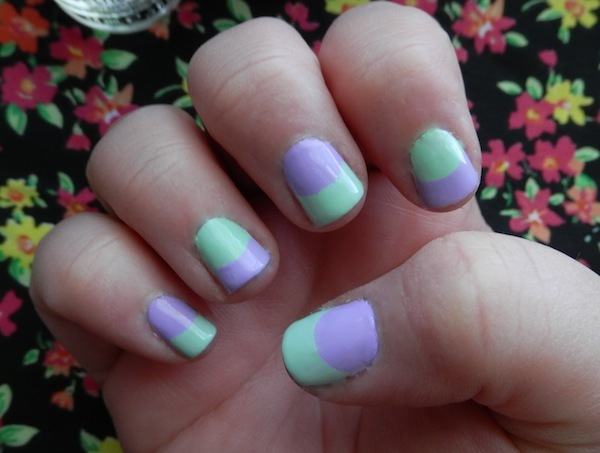 Two-tone pastel nails are ready to go. Perfect for your Easter egg hunts or spring brunches, I'm sure. Are you into two-tone nail looks? Would you consider using office supplies in your manicures? Do you feel as strongly about your top coat as I do about mine? This is lovely! I felt like I had my complete fill of nail tutorials because they all started blending but this one feels like a mermaid standing still in time with a slowly melting ice cream cone! I am feeling lazy today but might need to leave the house and go on an adventure just to buy some of that Lacey Lilac! Ummm, I'll be finding a way to use "feels like a mermaid standing still in time with a slowly melting ice cream cone!" as a personal review blurb in ONE WAY OR ANOTHER!